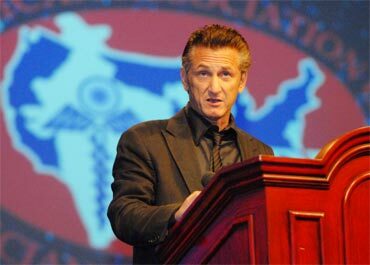 The attached article talks about Sean Penn being the keynote speaker at the AAPI convention. Pretty standard fare, except it was desi related – one, because of the 2000 Indian doctors and their families in attendance, and secondly, Penn acknowledging his inspiration for doing relief work in Haiti came from a quote by Tagore. As you may know, Penn has been recently in news for spending millions and most of his time in Haiti camps – as CNN describes it, “Penn is hardly new to heroic endeavors. He’s flown to the eye of a hurricane, to the front lines of war. A few years back, he traveled to Iraq and Iran and wrote about both countries for the San Francisco Chronicle. He was in New Orleans after Hurricane Katrina — his right arm bears a tattoo that says: “NOLA, Deliver Me.” His presence in all those places and now in Haiti draws skepticism and ire from those who think that celebrities use tragedies to burnish their public images. Penn has been mocked and caricatured by filmmakers, writers and talk-show hosts for taking up causes. Interesting – at least it looks like he is using his celebrity power to do good…and spreading the message.